Quinoa and Corn Chips: Kale chips rock! Kale is one of those foods I've been hesitant to embrace. I know it's really, really good for you, but there's something about the texture of cooked greens that turns me off. I love salads, and I don't mind some cooked greens thrown into an omelet or sauce, but I don't like a pile of cooked greens on my plate no matter how well it is seasoned or what it is paired with. So I was intrigued when I came across a recipe for kale chips. Basically all you do is tear off bite size pieces of kale leaves (don't include the stems), spritz or drizzle with olive oil, sprinkle with some salt, and bake in the oven for a few minutes, until they turn crispy and the edges just barely start to brown. I was skeptical, but since I got some kale in my bountiful basket this week, I decided to give it a try. And it honestly was good. The texture is really light and crispy. It almost melts in your mouth. The kale flavor isn't completely eradicated, but it takes on a kind of nuttiness that makes it much more palatable than when it's eaten raw. The best part of my little experiment was that my girls loved it! I told them I made "green chips" and set a bowl outside where they were playing. A few minutes later, that bowl was empty. I'm so excited I found a way to enjoy a really healthy food, and it's SO easy. The only confusion came from figuring out what temp to cook them at. When I googled "kale chips" I found a bunch of recipes that were all basically the same - but some said to cook them at 400 degrees for 5 minutes, and others said to cook around 200 degrees for 25-30 minutes. I split the two down the middle and roasted them at around 325 degrees for about 15-20 minutes. I don't think it matters which way you do it - the key is to keep an eye on it until you see the edges of the leaves start to curl and brown. That actually does sound good. All I have in my fridge is hot dogs, mayonnaise, baconnaise, ranch, and cheese. I think I need to go to the grocery store, and maybe I'll pick up some kale. I would never think to even try kale, but if my 2 adorable granddaughters tried it and liked it, then I must try it too. I am so impressed that you went back for a 2nd bountiful basket......is that one of my babysitting duties when I come in March???? Ange - you could tell him they're "Shamrock chips" that a leprechaun brought for Saint Patty's day. :) I honestly didn't think I'd like them either, but they were surprisingly chip-like. What a nice blog! I followed you here from BlogHer. I've been a member for awhile but haven't been very active. Need to work on that. 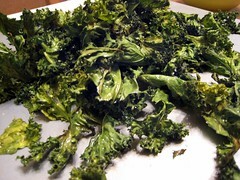 So, I've seen several recipes for kale chips and I love kale but haven't tried any of them, yet. Am shopping tomorrow so will pick some up. I should have done bountiful basket last week... or this week!! oh well I am gonna try the chips if i get stuck with kale... :) although i am still skeptical your girls are pretty adventerous eaters! Thanks Cheryl! I'm not as active with Blogher as I'd like to be either...just not enough time in the day, I guess. Kelly, if you sign up with Bountiful baskets, you'll get email reminders every Wednesday. I will try to remind you next week when I sign up.